Freer, who did not care for porcelain, admired the warmer appearance of white or cream stoneware from the Satsuma kilns in southern Japan. 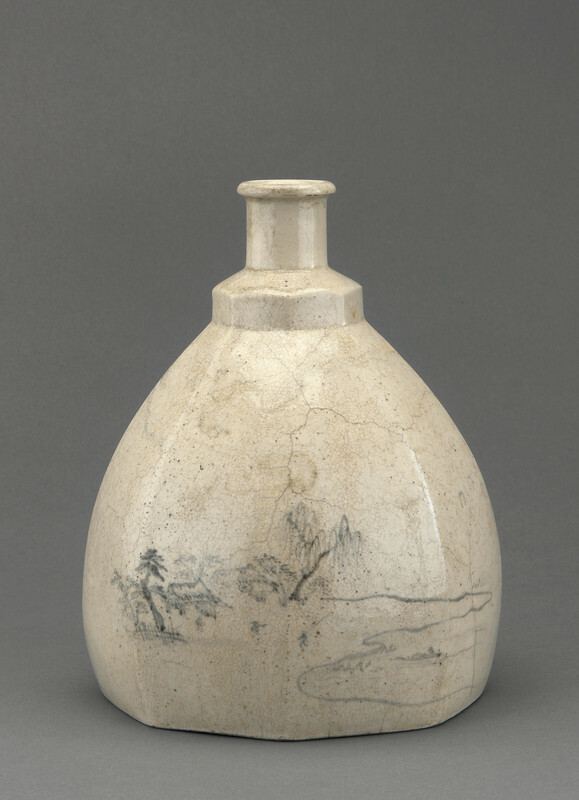 This hexagonal bottle was Freer's first acquisition of an Asian ceramic. The bottle bears scenes of fishermen along a rivera "Whistlerian landscape," as Freer described it in his inventory notes. Although Freer avoided the commercial versions of decorated Satsuma ware, made for sale at international expositions, he probably appreciated the parallels between this jar's refined decoration and the Japanese and American paintings he collected. In 1905, Freer acquired another sake flask of Satsuma ware (F1905.41), which was decorated so similarly to his first Japanese ceramic piece that Freer considered it to be "by the same workman." Decoration attributed to Kano Tangen, "Bottle," in The Peacock Room, Freer Gallery of Art, Smithsonian Institution, Accession No. F1892.26, Item #3315, http://www.peacockroom.wayne.edu/items/show/3315 (accessed April 19, 2019).